In the race to make our lives easier with their own tech, start-ups, apps, and lines of code, a group of young men make their own lives ridiculously complex while navigating the tricky terrain of the titular Silicon Valley in HBO's ingenious Emmy nominated hit. Yet rather than focus a majority of its energies on laughter with a more immediate punchline payoff on par with the "us vs. them" approach taken by network television’s smash sitcom The Big Bang Theory, Silicon Valley makes us feel like a fellow conspiratorial member of underdog compression start-up Pied Piper's team throughout. Operating like well-oiled comedic machines, while each technique serves their respective series well, it nonetheless provides an important distinction between two frequently compared programs. And when it comes to the HBO show, it's one that makes us feel far more invested in the in the goings-on of the stressful environment where with each laugh, we stumble a little further down the path of our slow uphill climb to the top of Silicon Valley. Fueled by conflict and chaos, the second season of Silicon Valley burns through as much plot in one half hour episode than ABC's sudsy watercooler drama Scandal does in double the running time and twice as many episodes. And while it's all played for fast-talking, fast-walking thrills in the arena of politics on ABC, the high stakes threats of lawsuits, bidding wars, and reverse engineering woes are no less compelling, despite Valley's laid back demeanor and witty presentation. But similar to the way that the average consumer isn't going to understand what it takes to make a computer run besides simply relishing in the end result, casual viewers aren't going to give Valley a deeper thought the first time around other than just kicking back for some much-needed Sunday night laughs. And that's precisely what makes taking a second and closer look at the stellar second season all the more exciting as within the first few minutes of the Emmy nominated season opener, patterns begin to emerge as you realize just how frequently throughout Valley, flickers of what will become some of its strongest subplots are woven into seemingly throwaway exchanges several episodes in advance. Namely, just like a stand up comedian will often close out their act with a punchline that harks back to one of the first jokes they made in the set, one of the most impressive feats of Silicon Valley's most recent season is in the way that the final cliffhanger in the season finale alludes to a warning given to our main character in the opening sequence of the season premiere. Obviously, of course, the layering in or foreshadowing of a plot twist that will pay off later on is hardly a new tactic in comedy or drama alike. But when you also consider the countless ways that Valley moves beyond the traditional juggling of an A, B, and C storyline each week without letting you forget the half dozen other characters potentially working against Pied Piper that could come out of the woodwork at any time, you begin to realize just how structurally sophisticated it is all around. 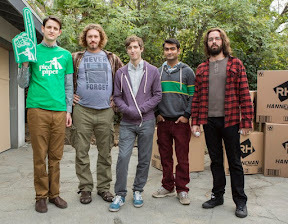 In addition to bringing in some terrific new supporting players to challenge the Pied Piper team in the ten episode second season, Silicon Valley's talented writers built upon the foundation they'd crafted in the first season to likewise enrich each individual preexisting character. As such, season two is at its best when it pins its ensemble cast into a corner and the forces the guys to rely both on their own intellectual creativity as well as each other to turn things around. 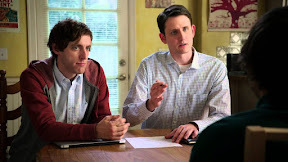 While Zach Woods remains one of my favorite bright spots as Jared, the selfless teddy bear often overlooked by the rest of the group, one of the smartest things the writing staff did was to expand upon the persona of Freaks and Geeks and Party Down sitcom veteran (and frequent series scene-stealer) Martin Starr's sardonically deadpan Gilfoyle. Knowing that they have an ace in the hole with Starr, Silicon makes him Pied Piper's secret weapon in season two as he instigates some ethically shady outside-the-box thinking that pushes the troubled start-up in some surprising directions for better and worse. 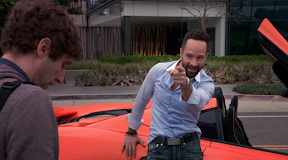 In addition to giving T.J. Miller’s larger-than-life Erlich Bachman a foil in the sleazy entrepreneur Ross Hanneman (Chris Diamantopoulos) – a rumored extreme composite of Donald Trump and Mark Cuban – which by extension helps soften some of Erlich's often tasteless edges, the series offers Amanda Crew’s delightful Monica a few more great female personalities to play off of as a straight (wo)man and potential romantic interest for Richard (Thomas Middleditch). 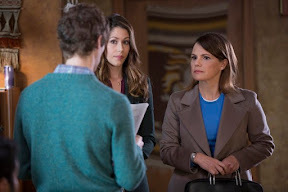 Although attempting to fill the shoes left behind by the death of first rate character actor Christopher Evan Welch who played oddball visionary Peter Gregory is an impossibly thankless task, casting Suzanne Cryer as Laurie Bream, another (yet decidedly different) oddball was one of the best behind-the-scenes decisions made by the comedy so far. Going from over-the-top crass to conceptual to cultural, the series (created by Mike Judge, John Altschuler and Dave Krinsky) culls comedy and conflict from any number of sources, which makes it compulsively watchable for its sheer unpredictability alone. Deriving some of its most relatable laughs from the stresses of work and everyday life from a precarious phone battery to income rivalry, in addition to skewering the tech industry, Silicon Valley makes a worthy successor to co-creator Mike Judge's word-of-mouth breakthrough hit, Office Space. Yet while it plays extremely well on its own as a highly entertaining sitcom, HBO's most consistently inventive, topical series is even better when you break down the method behind the madly funny code – reverse engineering the laughs to better appreciate what makes this tech comedy tick.